Mortgage Rates have spiked up “.3%” in the past 3 weeks and now sit at 5% on a conventional 30-year fixed with most lenders. It is important that buyers and homeowners looking to refinance understand that rates are going to continue moving higher due to rising inflation concerns in the economy. If rates continue to increase another .5% higher from where they are today, a buyer who can afford to purchase $600,000 today, will only be able to afford $567,500 using the same monthly payment, which is a loss of 5% in purchasing power. If rates continue to increase 1% from today, a buyer who can afford to purchase $600,000 today, will only be able to afford $535,000 using the same monthly payment. Here is why rates will continue to increase. It has been a rough month for rates. 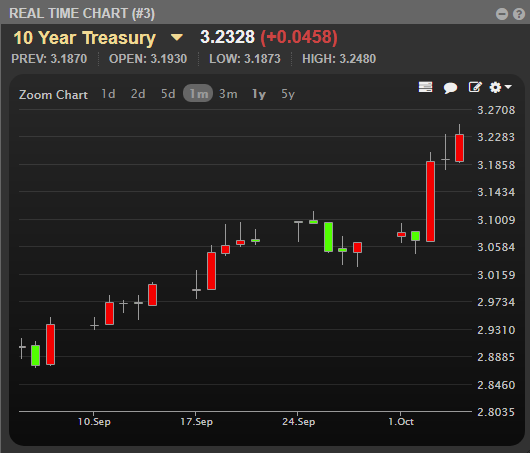 As you can see below, the 10-Year Treasury has spiked from 2.85% around the 10th of September to 3.22% as of this week, an increase of “.37%”. The 30-year mortgage rate follows the direction of the 10-Year Treasury. Mortgage rates have increased roughly “.3%” during this period. Here is why rates are going to continue to increase. Due to the recent slew of very strong economic data, the bond market is going through a correction phase right now, that can be summed up as “phew, The Federal Reserve has inflation covered” to “The Federal Reserve better wake up and get it under control before it’s too late”. Simply put: these past 2 months of very strong economic data finally put us in a situation where market participants are within their rights to wonder if the Federal Reserve is behind the curve and did not raise rates fast enough and if the economy actually could grow/inflate faster than expected, so the bond market is repricing rates accordingly and fast. Check out the chart below. The 30-Year Treasury is now breaking out of it’s multi decade lows at 3.34%. This is a significant trading level that dates back to 1987. Once these trading levels are broken, rates will usually continue increasing higher until they find a new level of support. We just don’t know where that next level of support is, it could be “.25% – .5%” or even higher from current levels. . If you know of any buyers who have been putting off a home purchase, or any homeowners who have been putting off their refinance, let them know their interest rate is probably going to increase as each month goes by. If you have the opportunity to lock in a rate for a home purchase or a refinance, you should LOCK in the rate immediately. Here is a chart that all homebuyers should review, that shows the “impact of rising rates on a buyers purchasing power or affordability”. As you can see, when rates increase by 1%, a buyer will lose 10.75% in purchasing power. When compared to rates historically, current rates are still good. This chart below puts current mortgage rates in perspective. Did you know the average 30 year fixed mortgage rate over the past 40 years is roughly 8.7%, and 6.29% over the past decade! Compare this to current rates around 5%. As rates are going to continue to increase, current rates are still attractive to anyone looking to borrow money to finance a home. As we approach the winter months, there are going to be lots of sellers who will be very motivated to sell their homes. Closing a transaction faster is a way to entice the seller to accept your offer and negotiate a lower price. We had a buyer get an offer accepted last week who was also able to negotiate a price reduction, as we told the seller we can close escrow in 10 days. They accepted a lower purchase price because they were going to get their seller proceeds faster. If the sellers are not receiving any other offers, give this strategy a shot. My company Citywide Financial Corp is closing Purchase Transactions in 15 days or less. We can close in 10-12 days if you need a special rushed closing. We are also giving clients a lender credit to cover their appraisal fee at closing. Contact me for more details. It is still a good time to buy a home. I tell my clients not to focus on the volatility in rates or home prices, but to find a home that you love and that you can afford for your family. We are entering the winter months soon, and many of the sellers will be motivated to sell their homes. There are already price reductions happening all over local markets, as sellers are starting to reprice their homes to match the reality of the current market we are in. It is a good time to get out there an put offers in on homes. If you find a very motivated seller, you may be able to pick up a good deal on a home. If you have any questions about getting approved for financing, feel free to contact me directly at 858-442-2686. I look forward to chatting soon!